Registration is now closed and will reopen in May, 2019. Please put your contact information in the right sidebar to be notified when registration is available! Don’t resolve to start another diet or exercise program. Make lasting change this year instead! Have you ever made a New Year’s resolution to start a new diet, or maybe join a gym, only to find that once the year started, you ended up slipping back into your old patterns? In fact, back when I was still struggling with food, my resolutions were ALWAYS about starting a new diet or joining a gym to make up for my excesses during the holidays. For example, I remember when I was still seeing patients in my medical practice, people would bring in all kinds of wonderful homemade goodies and gift baskets during the holiday season. The break room practically overflowed. One of my favorites was the tall pink cans of Almond Roca. If you haven’t had them, they’re filled with chocolate covered almond toffee wrapped in gold foil. Anyway, I’d start each workday telling myself that I wasn’t going to go overboard. But when the day got super busy and stressful, as it often did during the winter cold and flu season, I’d sneak into the break room to grab a couple of treats. I’d even take a few Almond Roca back to my office for later, because I was afraid they’d be gone when I came back! Of course, the thought of going back on Weight Watchers, my usual diet back then, caused me to eat even more since I knew deprivation was coming! Except after I started the diet, it never lasted long. I’d get tired of the restriction and start to have “cheat” days. Then I felt like a failure and kept overeating the foods I’d denied myself. I figured I could start again on Monday. Or maybe the Monday after that. That’s what I did for many years, a pattern I call the eat-repent-repeat cycle. But I’m free of all that now. These days, I prefer to set my intention to learn something new, improve my relationships, and travel someplace I’ve never been. That’s what brings me health and happiness! It took me a while to make that shift, though, because it’s so easy to get swept up in the old habit of setting New Year’s resolutions to start a new diet or exercise program. We’ve all been conditioned to make this our focus. It doesn’t help that we’re bombarded with all the advertising and hype to jump on board the next big thing. But what if you could make this New Year’s different? What if you had a more effective way to make lasting changes that give you the vibrant life you crave? 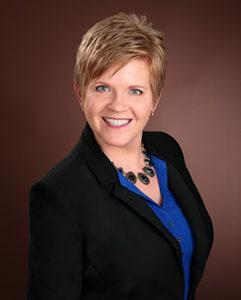 I’m Dr. Michelle May, founder of Am I Hungry? Mindful Eating Programs and Training, and the author of the Eat What You Love, Love What You Eat book series. And I have good news! It IS possible to start this year differently, so you get the lifelong changes you really want! But to get there, you need to think about your resolutions differently. The reason so many resolutions fail is because we try to change our actions without understanding WHY we do what we do in the first place! If you ignore the underlying reasons for your choices, you’ll eventually end up back in your old habits. And for many people, eating is a habitual reaction to their unrecognized or unexamined thoughts and feelings. Think about what happens when you go on a diet. You’re not paying much attention to why you feel like eating. You simply perform certain actions based on the rules: You eat when, what, and how much the rules tell you to. The problem is, diets don’t help you address times when you want to eat as a reaction to emotions or cues in the environment – like being surrounded by delicious foods, or feeling stressed or bored. At first, you might be able to use willpower to stick to the rules, but willpower is a limited resource that eventually runs out. When you get tired of all the restriction and your triggers or emotions become overwhelming, you go in the opposite direction and start to eat all the “forbidden” foods, often when you’re not even hungry. And when you start a new diet or program as part of a New Year’s resolution, even if you fully intend to get a different result this year, you’re likely to repeat those old patterns because you didn’t understand and address WHY you were eating in the first place. It doesn’t make you a failure. It just means it’s time to try a completely different approach that gets to the root of these patterns. When you can focus on why you eat to begin with, and find other ways of addressing the underlying issues, you can eat what you love without guilt. This breaks the eat-repent-repeat cycle and frees up your energy to live the life you deserve! Special invitation: Don’t go it alone! Learning to discover why you eat, and how to change your underlying thoughts and habits, isn’t something you should have to do on your own. That’s why I’m extending this special invitation for you to join our Mindful Eating Support Community. As part of this community, you’ll never be alone. You can feel confident about learning an approach that’s worked for thousands of people. No matter where you are on your journey, you will find a level of support that’s right for you. And remember, you deserve the big life you’ve dreamed of! When you’re making such a big change, you need to know you’re not the only one doing it. This is especially true with mindful eating because you’re doing something that’s unfamiliar to most people. It’s not like with a diet, where everyone has tried it a million times so you can talk about it with anyone and they’d know what you meant. This can be especially challenging when you hear people talk about New Year’s resolutions and trying another diet. Even though you know it won’t work, it might feel like you’re the only one who’s finally ready to admit it! That’s why all three levels include access to our private Facebook community. (Actually, it’s a secret Facebook page, which means that no one besides the Members can even see that you’re a part of it!) You’ll be able to share your experiences at any time with people who understand, because they’re on the same path as you. And in addition to the wisdom and support you’ll receive from other Community members, I set aside time each day to read your posts and do my best to guide you through this process. As part of this community, you’ll also discover that many people face similar challenges, so once a month, I choose a topic and do a deep dive in an hour-long Skill-Building Webinar. Now, if you’re already familiar with the Am I Hungry? 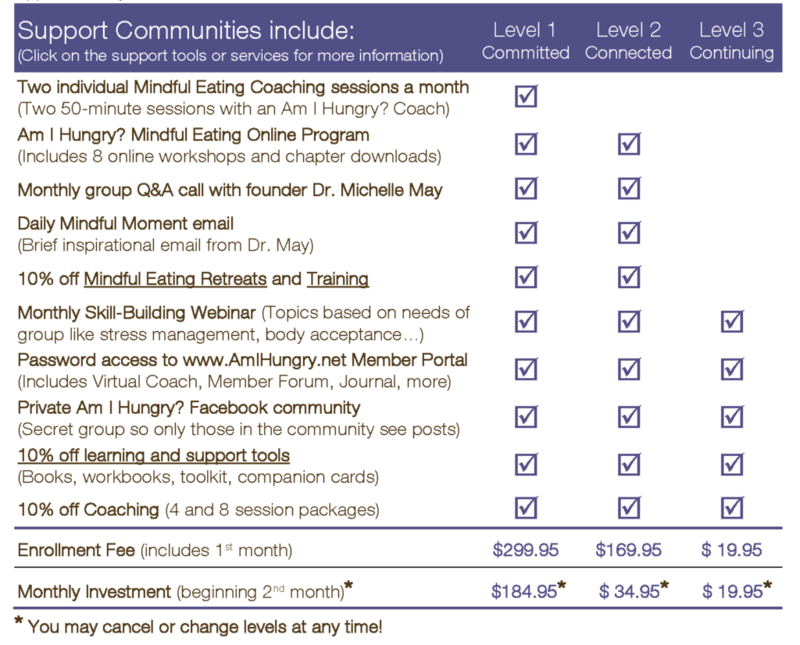 Mindful Eating Program and you’re just looking for connection and a refresher, Level 3 Membership might be all you need. But if you’re brand new to mindful eating, or you’ve never gone through a workshop or attended a retreat, then you’ll want more. So, in Levels 1 and 2, you’ll get the extra structure and guidance you need. In order to make a real, lasting difference in your life this year, you need to heal your relationship with food. This starts with understanding why you eat, then exploring the other decision points in the Mindful Eating Cycle – why you eat, when you feel like eating, what you choose to eat, how you eat it, how much you eat, and where you invest the energy you get from food. In Levels 1 and 2, you’ll have access to the online Am I Hungry? Mindful Eating Program to learn the skills and strategies to make decisions about your eating without restrictive rules. You’ll get one new workshop each week for eight weeks, and since the sessions are online, you can go through them or review them whenever and wherever you want. Learn how to respond when you overeat – and remember, everyone overeats sometimes! Build a great big life you love! Of course, you’ll have questions and face challenges unique to you. That’s why I hold monthly LIVE Q&A calls dedicated to hearing from you and talking through anything that’s tripping you up. And remember, you can always ask questions in our private Facebook group if you need feedback between the live calls. BONUS for our Level 1 and 2 Members: You can listen to a one-hour Q&A call for each of the eight workshops! If you need additional support or want to move along more quickly in your journey, you also have the option of working with a mindful eating coach. Members in our highest level of support, Level 1, get two coaching sessions a month. And Level 2 and 3 Members get a 10% discount on our Mindful Eating Coaching packages. Wherever you are in your journey, working with an Am I Hungry? Mindful Eating coach will help you explore the areas where you continue to struggle, then work together step-by-step to resolve those issues… and build the vibrant life you deserve. So, if you’re serious about changing your relationship with food—and the rest of your life—our Mindful Eating Support Community is the place for you! Access to our private Facebook community, where you can get support around the clock and form connections with people who will help you through difficult times—and celebrate the good times with you! Participate in monthly Skill-Building webinars and learn how to address life’s challenges without turning to food. Attend live monthly Q&A calls to get direct help on anything that’s keeping you stuck, learn from people who are sharing your journey, and inspire and encourage others with your experience and insight. And for Levels 1 and 2, you’ll get daily inspirational emails from me for eight weeks, plus a 10% discount when you sign up for any of our retreats or trainings – that alone would pay for your Membership! And one more thing… a BONUS for our Level 1 and 2 Members! You can listen to a one-hour Q&A call for each of the eight workshops! If you’re not ready to deal with WHY you eat yet, there are literally millions of diets, websites, and gurus just waiting to take more of your money and time. But if you’re finally done with all that, you’re invited to join us in our Am I Hungry? Mindful Eating Support Community! Becoming part of this community is the beginning of a life-changing journey, and it’s the perfect way to get a truly fresh start and make real, lifelong changes this year this year. So don’t wait! All you need do is decide what level of support you’re looking for then sign up today. BUT HURRY! Membership is only open for 5 days! In addition to everything included in Levels 2 and 3, Level 1 features two private one-on-one sessions with an Am I Hungry? Mindful Eating Coach each month. BONUS 30-minute coaching session in your first month to make sure you’ve chosen the right coach for you! Level 2 is perfect if you’re new to the Am I Hungry? mindful eating approach or need a refresher. Remember that all levels provide you with a connection to others who are on this journey too, so you can practice your new skills in an active supportive community. Level 3 is for you if you’ve already participated in an Am I Hungry? program (such as a Mindful Eating Online program above, or a workshop, retreat, workplace wellness program, or self-paced program) and want additional support as you expand your mindful eating skills. Let me know when registration opens. "People are stopping to think before they eat and asking, 'Am I hungry? Why am I eating this food?'" "After a lifetime of dieting using many of the most well-known programs out there, I found Am I Hungry? refreshingly wise...something I can actually live with." "Dr. May's unique way of addressing food and eating issues obviously resonated with many employees in the audience." "Excellent format to help someone passionate about this work deliver the message of mindful eating and overall health and wellness in a credible, evidence-based, professional manner." "This was the BEST program that I have participated in at work. I learned a lot about myself and the skills to live, eat, and manage my life." "I came to this retreat looking for a totally new perspective and I found it. I feel like I've begun a whole new life." "Am I Hungry? supports permanent change on so many levels. It is not just food and nutrition; it's about nurturing myself. I loved it!"